Two men standing in a homestead with a hut behind them demonstrating the use of clubs with spears in their left hands. One of the men is wearing thiau armrings which would have meant that the left hand was practically useless for brandishing a weapon, they are bound so tightly. 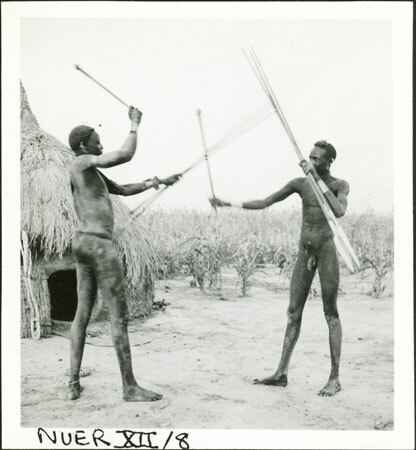 They are described as western Nuer men, possibly either Leek Karlual amongst whom Evans-Pritchard spent most time in 1936 or else Western Jikany. Note on print reverse ms pencil - "1 W.Nuer" & print front border ms ink - "NUER XII/8"
Morton, Chris. "Nuer duelling" Southern Sudan Project (in development). 03 Jan. 2006. Pitt Rivers Museum. <http://southernsudan.prm.ox.ac.uk/details/1998.355.550.2/>.